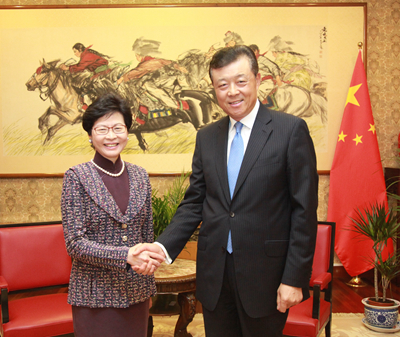 On 26 September 2016, Ambassador Liu Xiaoming met with Chief Secretary for Administration of the Hong Kong SAR Government Carrie Lam Cheng Yuet-ngor at the Embassy during her visit to the UK. Ambassador Liu said that this year was the first year of the "Golden Era" of China-UK relations. President Xi Jinping recently met with Prime Minister Theresa May during the G20 Hangzhou Summit. They reached important consensus on further developing the Global Comprehensive Strategic Partnership for the 21st Century and making joint efforts to upgrade China-UK ties in the "Golden Era". Ambassador Liu pointed out that the good relations between China and the UK would be beneficial to closer exchanges and cooperation between Hong Kong and the UK in economy, trade, culture and other fields as well as conducive to Hong Kong's stability and prosperity. The Chinese Embassy in the UK would continue to support Hong Kong to expand its cooperation with the UK, support the work of the SAR Government and Hong Kong Economic and Trade Office London, and provide high-standard services to Hong Kong compatriots. Chief Secretary Carrie Lam briefed the Ambassador on the current political and economic situation in Hong Kong and her visit to the UK. She said that Hong Kong under "one country, two systems" had enjoyed prosperity and stability and had expanded exchanges with the world thanks to the strong backing of the motherland and the valuable support of the Central Government and the Ministry of Foreign Affairs. She thanked the Embassy for its long-term support to the work of the Hong Kong Economic and Trade Office in London and its assistance to Hong Kong compatriots. She stressed that Hong Kong would make full use of its advantages and continue playing a positive role in China-UK cooperation, so as to add splendor to the "Golden Era" of China-UK relations.